Order 3 boxes or more and we'll deliver for free to all major centres in SA! I would like to stock up on some Güdsheet. Please contact me. to underprivileged schools & crèches in need. Poor sanitation is the main cause of diarrhoea related diseases that kill hundreds of people every day. It's also a leading contributor to endemic poverty, which is a major drag on the economic growth of our country. 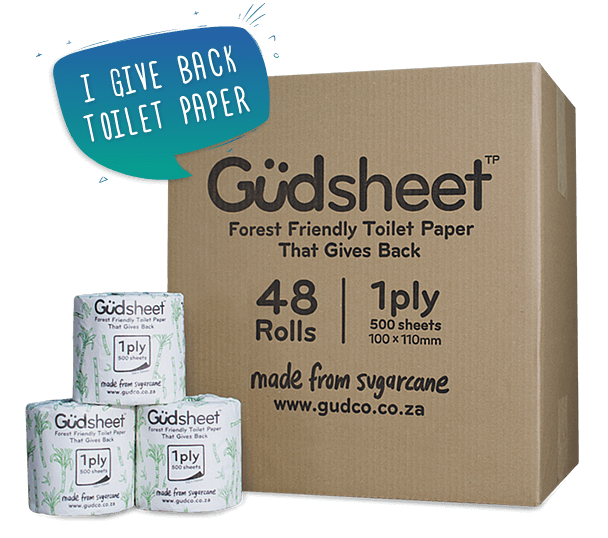 Through your purchases, Güdsheet helps provide Toilets & Toilet Paper to underprivileged schools & crèches in need. Why toilets & TP? Because they provide dignity, health and an improved quality of life. We give a sheet. Do you? a portion of the proceeds goes towards improving water & sanitation in South Africa. Help those in need. Buy some Güdsheet. What makes Güdsheet so good? Our rolls are made from 60% sugar cane fibre and 40% FSC approved wood pulp to ensure sustainable afforestation. Each roll is individually hand-wrapped with love, in eco-friendly paper to promote hygiene, and packed in recycled boxes to replace plastic. We don't use any chlorine, acids, inks, dyes, scents or weird perfumes in our toilet paper. It is bleached using an elemental chlorine free (ECF) process that's good for you and the environment. Our hybrid blend of sustainable fibres give each sheet its silk-like softness, and no-nonsense strength you'd expect from a premium TP brand. 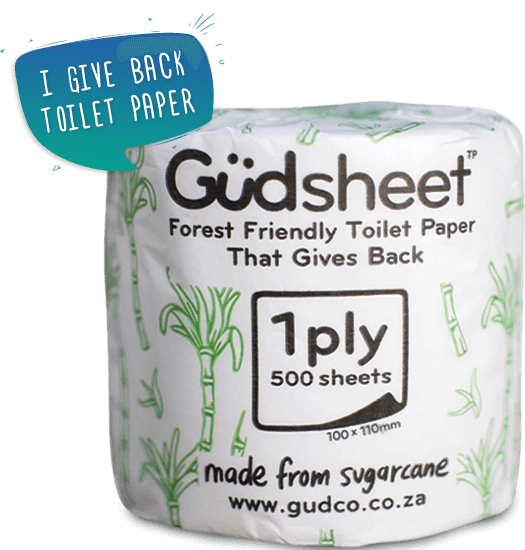 Switching to Güdsheet toilet paper can contribute toward your company's social responsibility and sustainability goals. It's probably one of the easiest things you can do to help those less fortunate and the environment. Humans flush about 27,000 trees daily. Together we can help protect our environment for future generations through the choices we make every day. Why should I give a sheet? Güdsheet toilet paper is designed to be used by everyone. From industry to home users, corporate users, estates, townhouses, game lodges, hotels, big and small businesses, municipalities and government. Together we can solve SA's water & sanitation crisis for good. Order 3 boxes or more and we'll deliver for free to all major centres in South Africa. If you'd like to order 1 or 2 boxes, then you can still enjoy the convenience of having your order delivered to your door for only R125. Email hello@gudco.co.za for custom rates on bulk orders. What is the difference between your 1-Ply and 2-Ply toilet paper? Simply put, our 1-Ply TP consists of a single layer of paper, while our 2-Ply has two layers which makes it twice as absorbent. Both are made from a mix of 60% sugar cane fibre and 40% FSC approved wood pulp to produce a much stronger and softer tissue that's good for you and the environment. The other big difference is that Güdsheet 2-Ply helps to build Toilets for underprivileged schools & crèches, while the 1-Ply provides Toilet Paper to those in need. So, it doesn't really matter if you prefer 1 or 2 ply TP, as long as you choose Güdsheet TP. How does Güdsheet compare in strength and softness to other toilet paper brands? Unlike recycled toilet paper, which can be rough or thin, sugarcane fibres produce a much softer product. And it's strong, too! Our mix of 60% sugarcane fibre and 40% FSC approved wood pulp, produce a much stronger and softer tissue than many virgin toilet paper brands. Is your sheet Sewer & Septic Tank Safe? Yes, Güdsheet is 100% biodegradable. Our toilet paper is made from natural fibres which can quickly dissolve back into the earth - making it safe for all disposal systems. What makes Güdsheet better than the sheet I am currently using? Most premium toilet paper rolls are produced from old growth trees, also known as virgin toilet paper, or "Badsheet" as we call it. These precious old trees can take up to 30 years to grow, and the sad part is that the softer your TP, the older the tree. Processing trees into toilet paper consumes so much more water and energy than the minimal processing necessary to turn sugarcane into paper. 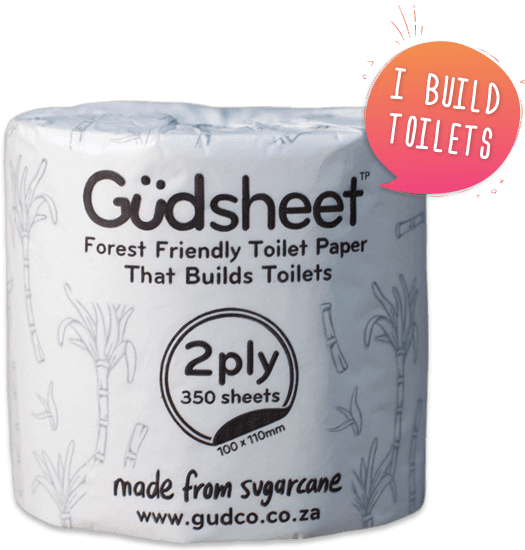 In fact, Güdsheet uses fewer natural resources with every flush than 100% virgin toilet paper. From an environmental perspective, recycled toilet paper should be the obvious way to go. However, recycled TP generally contains BPA, which is widely used in the paper made for the thermal printers that produce sales receipts (which are then recycled and turned into toilet paper). The ink in newspaper (which is often recycled) is another source of BPA which can be found in recycled tissue after de-inking and cleaning recycled paper. BPA, as you probably know, is linked to cancer and early puberty. We don't know what the actual health implications are of rubbing toilet paper with traces of BPA on our nether parts. But it seems reasonable to avoid this exposure. Fortunately, Güdsheet Toilet Paper is 100% BPA free. Plus, we don't use any chlorine, acids, inks, dyes, scents or weird perfumes in our toilet paper. So worry not - it's as good for you as it is for the environment! We have established The Güdfoundation that remains committed to improving water & sanitation development in the Eastern Cape of South Africa. If you would like to contribute to this cause, consider buying some Güdsheet. How will the participating school benefit? How can my school take part in the Güdsheet Challenge? 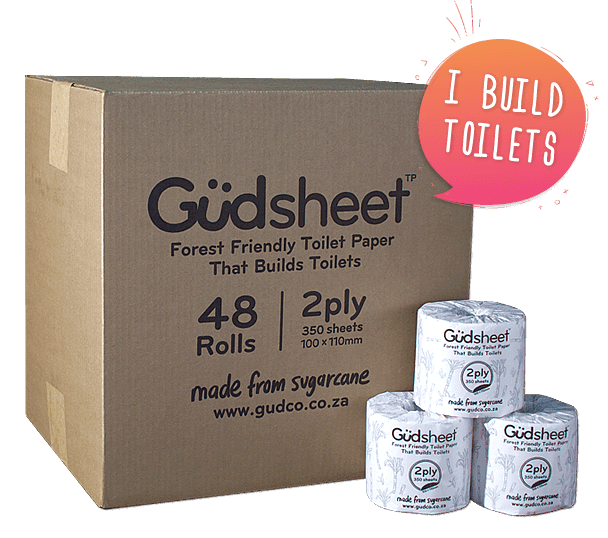 We are challenging 200 schools in South Africa to sell 200 boxes of Güdsheet toilet paper that will help build 200 Toilets for underprivileged schools & crèches in need. To achieve this goal, 200 pupils from the participating school will only need to sell 1 box each, which gives back R36 to help build a toilet. By selling 200 boxes, your school will automatically be donating R7200 towards this good cause. The participating school will receive R4000 for completing the challenge and 10 participating pupils will each WIN R200 in a lucky draw! We are Güdco - the good company that produces quality goods, for good. We believe that most people want to help those less fortunate, they just might not have the time or means to do so. Güdco products provide an easy and convenient way for you to help, whilst purchasing a commodity you need. 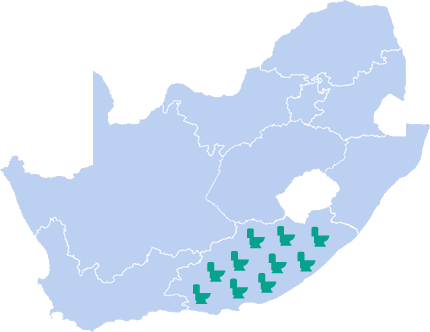 By using Güdco products, you're consciously helping to change SA for good. Like us on Facebook or follow us on Twitter and Instagram. The more people we're able to reach, the more communities we're able to help. So tell your friends, family and colleagues about Güdsheet and good things will happen.